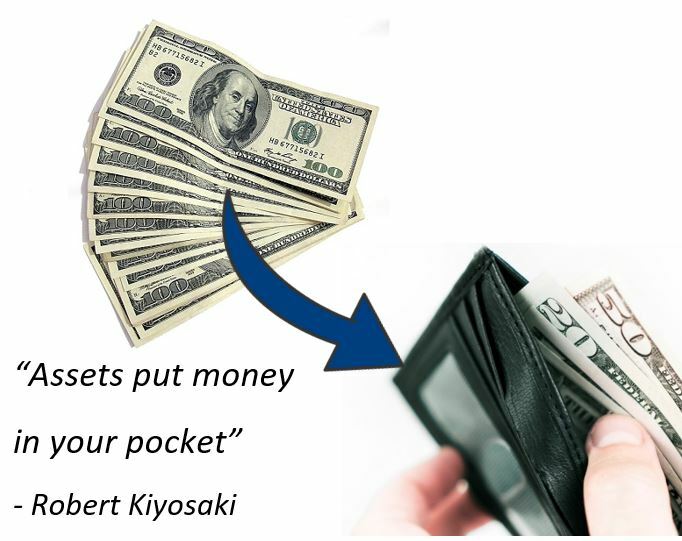 Building cash flow from assets is one of the key lessons from Robert Kiyosaki's great book "Rich Dad Poor Dad". He describes how wealthy people (such as his rich Dad) focus on building up assets whilst keeping their liabilities to a minimum, while less financially literate people (i.e. such as his Poor Dad) misunderstand what assets are and do not focus on cash flow from them. 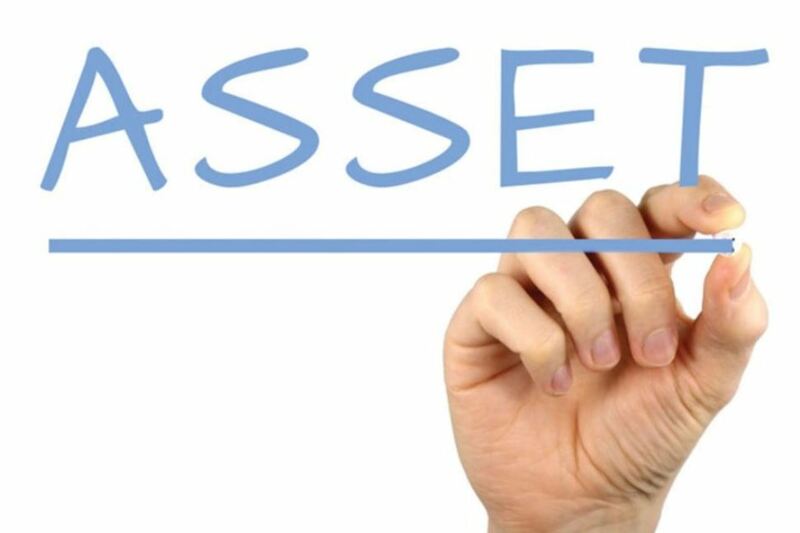 One of the most important lessons from this book is how to define an asset. According to Kiyosaki (and we agree! ): "Anything that generates you cash is an asset... and anything that takes cash from your pocket is a liability". Therefore, expenses on things like cars, luxuries and, yes, your own house... are liabilities. Why? Because they take cash out of your pocket. You need to purchase them and in many cases pay for their ongoing maintenance and insurance. All of these actions result in cash leaving your account every month. If you want to build wealth then you need to focus on building cash flow from assets. 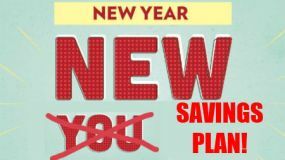 Once you purchase genuine income producing assets, then they will pay you year after year. Next time you walk down the street have a look around. There are assets all over the place. You may see a block of apartment buildings. Someone, somewhere, owns these. Every month the tenants of those apartments pay the landlord a rental check. A property bought to rent out is an asset as it pays you rental income every month and you should be able to raise those rents roughly in line with inflation over time. This is another hallmark of a successful investment: it allows you to increase your cash flow from assets as time passes. Be cautious of assets whose revenue decrease with time. As you walk down the street, you will probably see lots of small and medium sized businesses (SMEs). These SMEs could include a restaurant, bar, dry cleaning store, theatre, garage, fast food chain, grocery store, or retail shop. These businesses usually rent their property from a commercial landlords. Again, someone somewhere owns these properties and receives rental payments from these businesses. These assets are commercial property and, landlords should be able to raise those rents over time in line with inflation. Indeed, those businesses are also assets for their owners, as long as they are making a profit. As you walk around, you may see some government buildings or projects. Let's say you see a bridge that can take you over a river that was financed by the government. Where does that money come from? Well it could be taxpayers but most governments spend more than they earn (sadly for our economy, it's a vote winner) and they have to finance these projects somehow. How do they do that? Well they use the bond market where they can borrow money. That money, of course, is not free and whoever lends them the money (or owns the bonds) will demand interest payments or coupons. So once again, all government debt (both federal and state) is owned by someone out there who is collecting income in the form of interest payments. Do you enjoy listening to music or watching movies or TV shows? The producers of that content "own" the rights to it. The work is done early on by the original owner who then "rents" out his or her asset and receives royalties or licence fees in return. Just think of all the music Elton John and Bernie Taupin produced dating back to the 1970s. The royalties from radio play alone are probably enough to fund a rock star lifestyle, many decades after doing the original work. Their music is an incredible financial asset. Every year, "Mary Poppins" is shown on TV channels around the world. Disney owns the rights to this and earns every year from movies like this in its "back catalogue". Building your cash flow from assets - How to own a buiness, without "running a business"
No time, money or inspiration to run your own business? Never mind, thanks to the stock markets - it's still very easy own business assets. The stocks sold there - just under 50,000 of them world wide allow busy people to own a piece of a business. When you own a stock, you have a claim on their earnings and dividends and so you may well get paid for owning these stocks. Take a well known stock such as McDonald's. According to the 2017 annual report, McDonald's paid out just over $3 billion in dividends during the year. That is real cash going to owners of McDonald's stock all over the world. The amount you get paid depends on the number of shares you own. If you invest diligently and buy up McDonald's stock to a point where you owned just 0.001 percent of McDonald's then you would be earning over $30,000 per year in dividends. The whole point of this page is to illustrate the thousands of opportunities you will encounter to add cash flow from assets into your pocket. This is the key to building wealth and the focus of books like "The Richest Man in Babylon" or "Rich Dad Poor Dad". 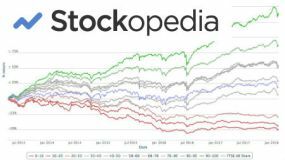 Often when you mention stocks, people are obsessed to whether the market is going up or down, whether interest rates or unemployment will go up, what will happen in the next election and so on and whether stocks will rise or fall as a result. 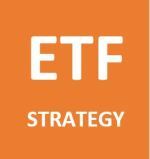 You mustn't judge your performance on whether the stock you own has gone up or down in price but you must judge it on whether the assets you have acquired will have the ability to send you more and more cash over time. So when you're considering your personal financial situation, think most carefully about building cash flow from assets. 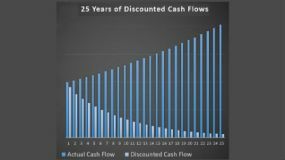 How reliable is that cash flow? Can you imagine it being there in 30 years' time. Can you imagine it having increased steadily? Make building cash flow from assets your obsession not fluctuating stock prices and you will have a less painful and more productive financial life.